During these chilly, autumn days, a lot of us like to cozy up with steaming, hearty dishes like creamy pastas, meaty stews, and gravy-topped everything. Unfortunately, many of these hearty dishes require the use of heavy, not-so-healthy ingredients, such as heavy creams and butters. 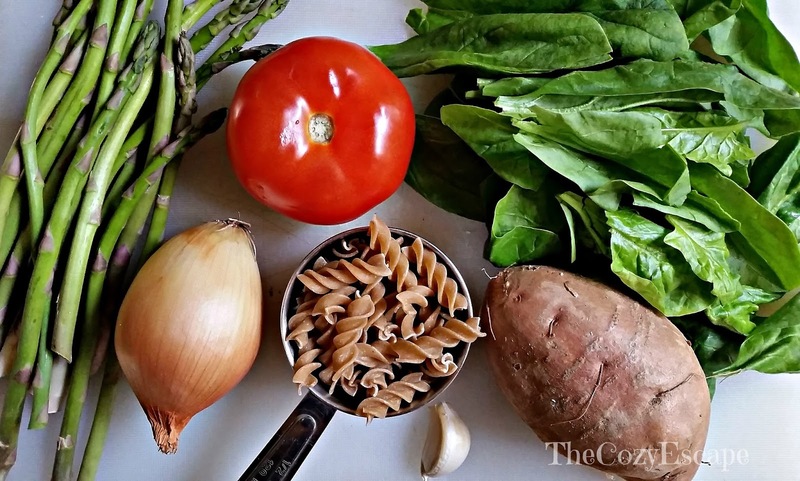 While indulging on an unhealthy meal once in awhile won't do you too much harm, frequently relying on these types of meals to fill you up will sure enough wreak havoc on your health and your gut. Fall wants us to enjoy cozy meals, so it graciously gives us a bountiful harvest of healthy, nutrient-filled ingredients that will give meals the illusion of being heartier without making them unhealthier. One of these ingredients is the mighty sweet potato. The deep orange color of a sweet potato is practically a neon sign advertising its health benefits. Like other orange fruits and veggies, sweet potatoes are an abundant source of beta-carotene, which is a powerful antioxidant that benefits eye, skin, and immune system health. Sweet potatoes are also a healthy starch that actually promote better blood sugar levels and have a good amount of fiber. Therefore, sweet potatoes are a perfect addition to diets of those with diabetes or those who are trying to lose or maintain their weight. Not only are sweet potatoes arguably one of the healthiest foods, they are also sweet, delicious, and buttery, making them an excellent addition for recipes requiring "thickness". 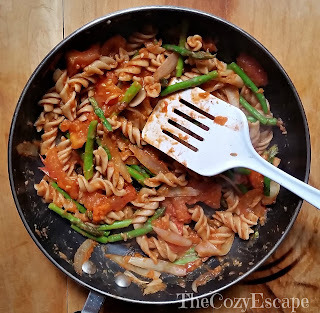 In today's recipe, I mixed sweet potatoes with cashew milk to create a healthy, creamy sauce for this autumn pasta recipe. 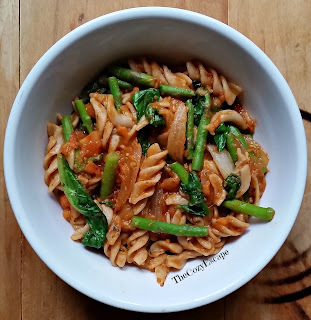 This sauce combined with the added powerhouse vegetables listed below tricks to you think that you are indulging in one of fall's decadent dishes while you are actually enjoying a healthy filling meal! Cook your noodles in a pot to your desired texture; I prefer mine softer. Be sure to only lightly salt the water when cooking the noodles. Drain the noodles, and set them aside. 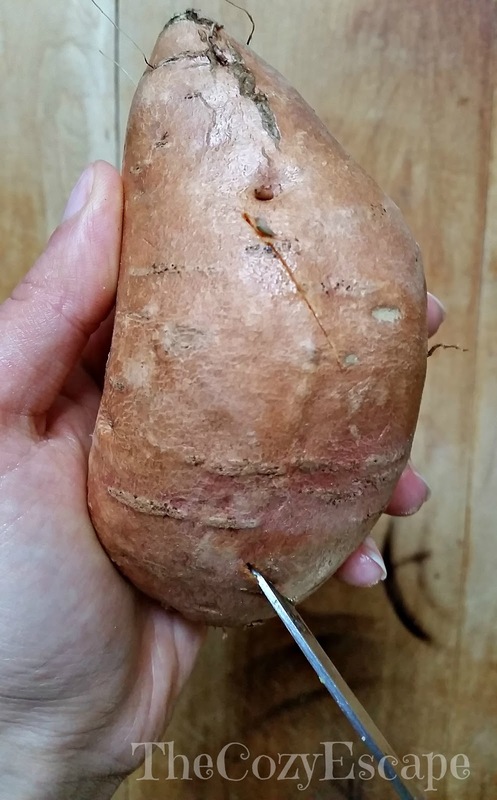 Pierce your sweet potato with a knife all over its surface. Bake the sweet potato in the oven or microwave; the microwave will be faster, only taking about 5 minutes depending on the size of the sweet potato. Once the sweet potato is soft, peel it and mash 1/2 of it. You will need 1/4 cup of the mashed sweet potato. To make the creamy sauce, blend together cashew milk, tomato paste, and mashed sweet potato in a bowl. Stir in salt, pepper, paprika, vinegar, and chili powder until the sauce is thoroughly mixed. 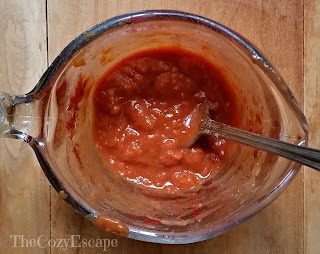 The sauce will form into a thicker, orangey-red paste. Set the sauce aside. 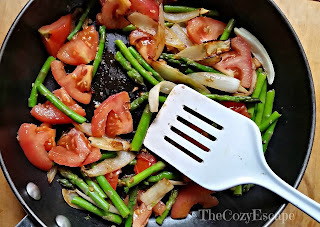 Slice the onions, chop the asparagus, and cut the tomato into quarters and then thin slices. 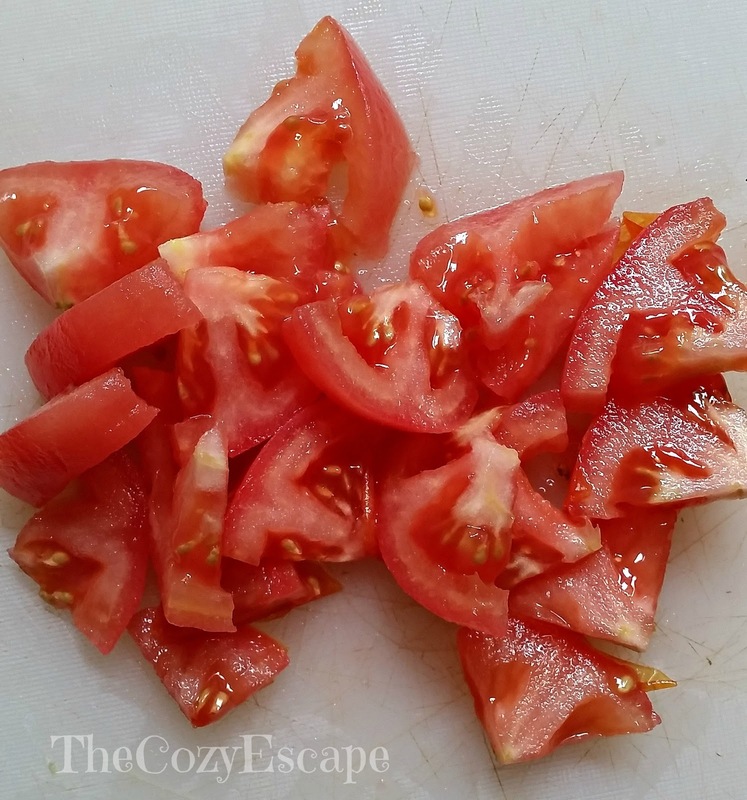 Set aside the onions and tomato. 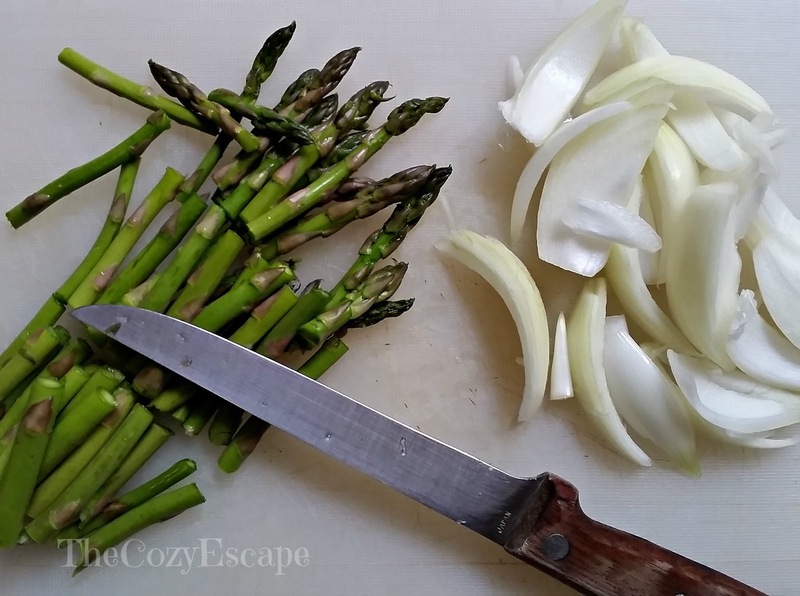 Place the asparagus into the frying pan and add water until the asparagus pieces are almost covered. Steam the asparagus on medium-low heat until they are just starting to become tender. Drain the asparagus, and set the asparagus aside. Heat olive oil in the same frying pan. Once the oil is hot, throw in the onions and mix them with the spatula, ensuring that all the onions are coated with oil. Sauté the onions, occasionally mixing them to prevent them from sticking to the pan. Once the onions are beginning to turn brown, add the garlic and mix everything together. 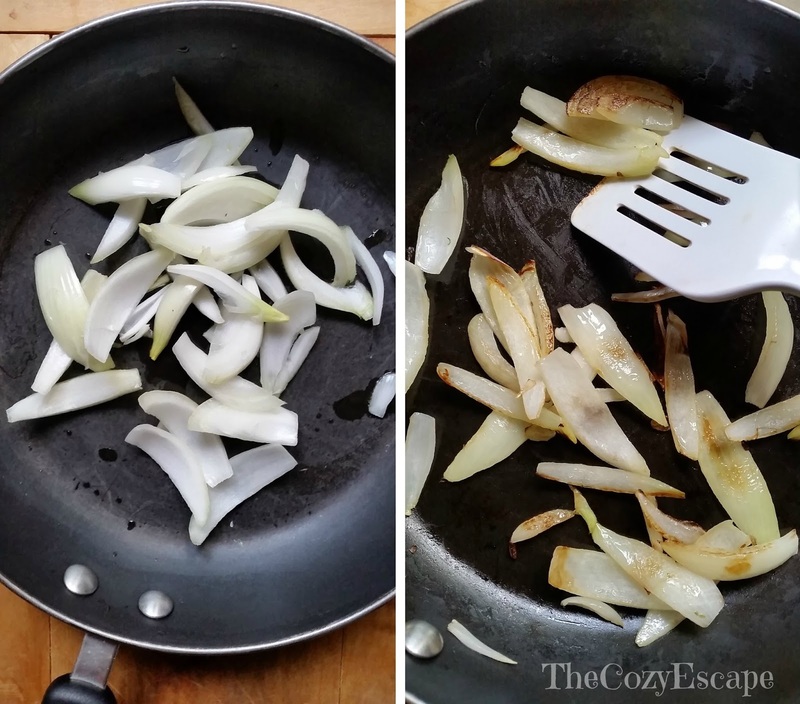 Continue sautéing the onions and garlic until the garlic for about 2 minutes. Then, toss in the asparagus and tomato slices. Heat the vegetables until the tomatoes just begin to break down and the onions become even more golden. 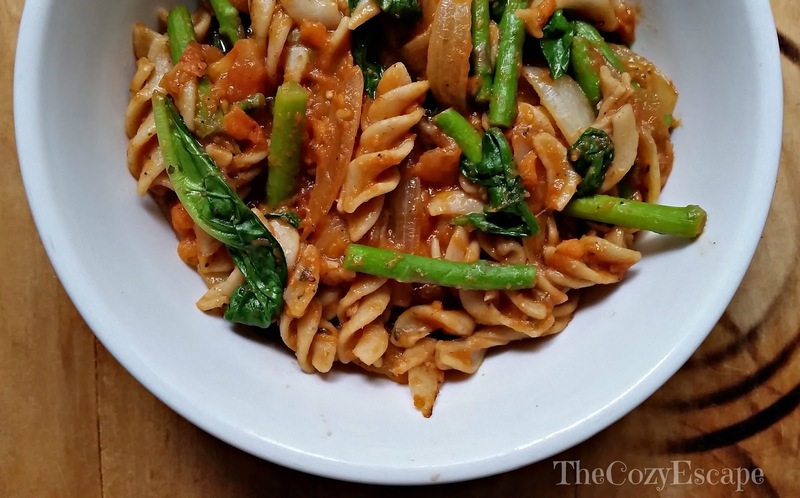 Once the tomatoes are warmed, add the pasta and creamy sweet potato sauce. Combine all of the ingredients together and taste it, adding salt and pepper to taste. Continue heating everything for about 3 to 4 minutes to let the flavors blend together. After about 3 minutes, mix in the spinach and toss in a sprinkle of basil. Cook the pasta until the spinach wilts. Serve the pasta hot and happy autumn eating!